23. 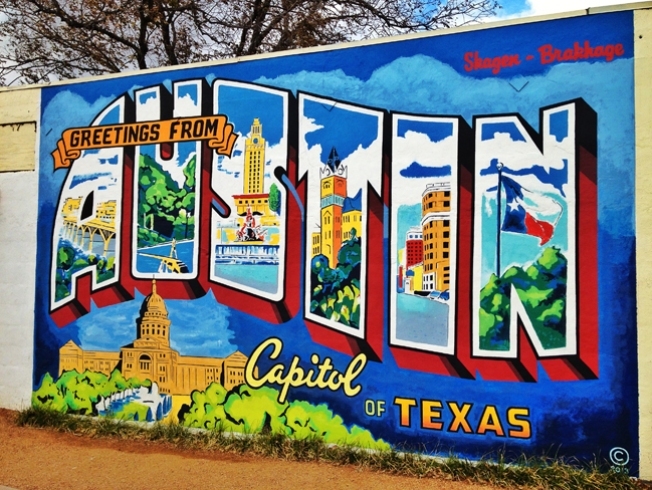 Austin, TX: La capital de Texas ha acaparado la atención nacional gracias a los 25 años del festival SXSW y por ser sede a eventos deportivos como la Formula 1 y los X Games. As a plane with a Grumpy Cat flag flew overhead, courtesy of Friskies, the Technorati flooded into panel discussions and happy hour spots at the annual tech festival South by Southwest in Austin, Texas, on Sunday. Top tech influencers pondered immortality and mind cloning. FireChat, an app that lets smartphone users connect via mobile chat even without a cellular connection, was another hot topic. Here's a look at the most notable trending topics Sunday at the tech jamboree. No cell service? No problem. An app called FireChat uses phone signals such as Wi-Fi and Bluetooth to connect to other users' phones and enable chats without any network connection. The app, created by a San Francisco startup called Open Garden, debuted in 2012 and was a hit last August at the Burning Man festival in Black Rock, Nevada, where cell phone service is scarce. It links people via what it calls a "peer-to-peer mesh network," connecting through phone signals rather than a network. The range is about 90 feet but the connection can jump from phone to phone if there's a crowd. It's software-only, says co-founder and CEO Micha Benoliel. Currently the app supports public group chats and hashtags; private messaging is coming. The app, which is a finalist for South by Southwest's innovation awards, has 5 million users and has been used by tens of thousands of people in India and the Philippines at political protests. As a new startup, Benoliel says his first time at South by Southwest has been positive. "The best surprise has been going to parties and having people asking how they can use FireChat for their event," he says. United Therapeutics CEO Martine Rothblatt, who considers herself a "transhumanist," discussed advances in "mind cloning" in a keynote Sunday. She said she believes people will one day be able to clone their cognitive functions, and detailed her biotech company's advances in cloning organs and making the process of transferring organs from donor to recipient more efficient. Rothblatt urged everyone to question authority and noted that in other eras she might not have survived as a transgender person. "I was fortunate to be born in California and to have a president who can easily say the word transgender without tripping over it," she said. In a separate panel, transgender tech executives discussed challenges they've faced in the industry. Brielle Harrison, a senior software engineer at Facebook who helped the social media site revise its gender options, talked about having a "perma smile" on her face after she came out as transgender at work. "It's one of those things you're generally born with, you have one choice, hide or not hide," she said. "You realize we just need to help educate and have other people understand that we have the same desires, passions, hurt feelings and emotions that everybody else has." The line to hear digital media futurist Amy Webb speak stretched around the corner at the new J.W. Marriott hotel in Austin long after the panel started. Webb, whose clients including Twitter, Time and ad agency Publicis, says she studies how and why people are wasting their time on mobile and where they are having difficulty with technology in order to predict new trends. Two areas she predicts will be big in 2015: "haptics," which add a tactical component to notifications, and mobile ambient alerts, which could buzz to notify you without being overly intrusive. Some examples of "haptics" include the Pavlov app's electric shock, which can punish users if they smoke or overeat, or a shirt by Australian company Foxtel called "Alert Shirt" that uses wearable technology to let soccer fans feel the body blows their favorite soccer player gets during a game. Using ambient alerts, a finance app could buzz when you are considering a purchase -- a nudge to remind you "do not try to purchase something right now," she said. Festival goers needing a break from the hubbub of SXSW can take a trip back in time with an immersive audio tour from startup Detour that lets listeners discover Austin in 1885, "the year that broke Austin." The tour leads users to key locations in a tale about a time when the city did not yet have electric street lights and there was a possible serial killer on the loose. The audio tour leads listeners into historic sites, stores and bars along the way. "You'll get the smell of 1885 in your nostrils, the sound of murder ballads in your ears, and --if you're in the mood -- the taste of tequila on your tongue," according to an online description. The tour was created by San Francisco-based Detour, a startup headed by Groupon founder Andrew Mason. Detour has seven audio tours available in San Francisco and created the Austin tour to get the attention of South by Southwest attendees. "It engages all senses, it's a new medium in storytelling," said Ben Adair, Detour's head of content.